Marvel superheroes are more popular in 2019 than ever before, and we don’t mean just the movies! The popularity of Marvel’s superheroes extends well past the box office and your local comic book store these days. There are tons of merchandise available for fans who want their favorite heroes on their bed sheets, stationery, and even shower curtains. Of course this means that there are also a variety of different Marvel themed chess sets out there! 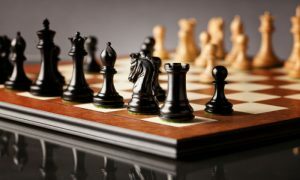 The following collectable super hero chess sets would make a wonderful addition to your collection, whether you collect Marvel themed items, chess sets, or both! This would also be a perfect, thoughtful gift for someone who likes to collect these types of things. Almost everyone these days is a superhero fan, but some people go beyond that to become superfans. This type of person is heavily invested in their favorite superheroes and may like to have a themed chess set that features them. 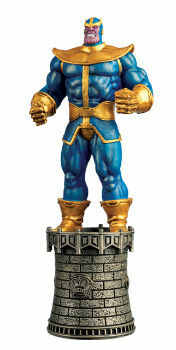 If you are a Marvel superfan, we’ve got the perfect chess set for you! 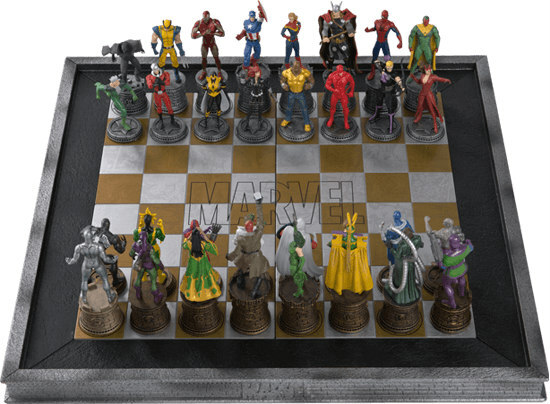 This is not only a great Marvel themed chess set, it is THE Marvel chess set. The great thing about it is that it comes with tons of different piece options, meaning that you can assemble your armies from your favorite superheroes and villains, and end up with a totally unique Marvel chess set and a team that’s been handpicked by you. Of course, you can also collect all of the available Marvel pieces, but that may take a while since there are nearly 100 different ones! Some of them are also more rare or in demand than others, so you’ll need to act quickly to get the ones you want. Now, you may be thinking that this set is only for decorative purposes. After all, if you can mix and match heroes and villains to make up your personalized armies, it must be pretty difficult to determine which piece is which, right? Not so. The maker thought of that problem when they were designing this modular superhero chess set, so each and every piece is marked with the symbol of the chess piece it functions as, so you can actually use this set to play chess and you’ll always know which piece is which. 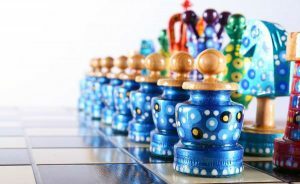 Each of the collectible Eaglemoss Marvel chess pieces is hand painted with remarkable attention to detail. The artistry and workmanship on these pieces is really impressive and sure to satisfy even the most discerning collectors and super-fans. 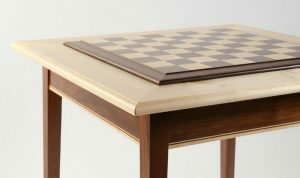 The chessboard that matches this set is decorated with the Marvel logo and a unique all-over comic print. 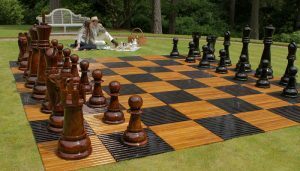 The bronze and pewter toned Marvel chess board provides the perfect backdrop for battles between your hand selected armies of heroes and villains. 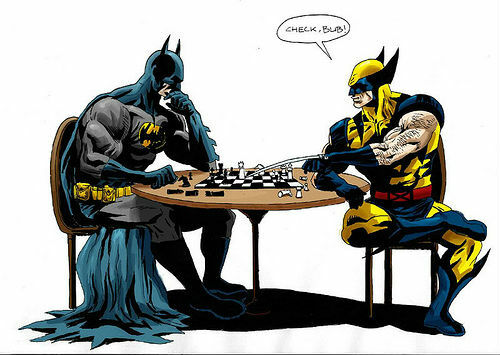 Ok, technically this isn’t a Marvel chess set, but we thought that it was just too good not to share. Although there is a friendly Marvel vs DC rivalry, in reality most people are fans of both types of comics, though they may prefer one over the other. 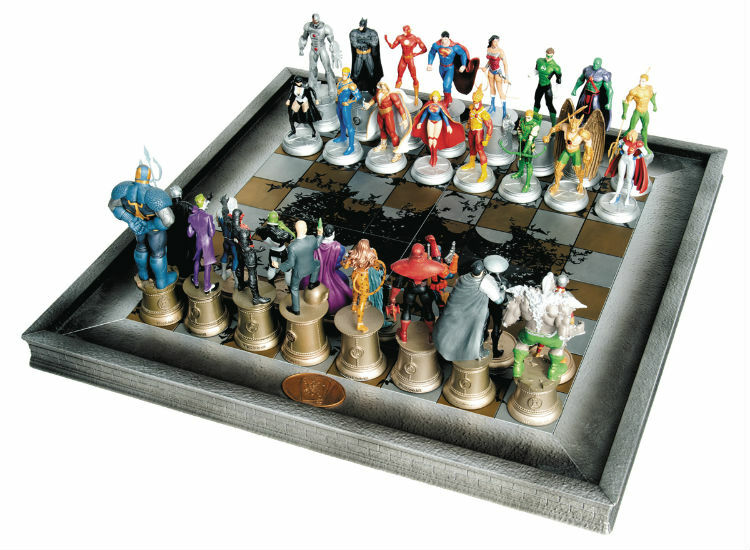 Though, if you wanted to, you could combine this Justice League chess set with some of the pieces from the Marvel chess set to make your own Marvel vs DC chess set and have your favorite heroes from both universes face off against each other! The 32 pieces Justice League chess set is the official DC comics chess set, and the highest quality Justice League themed chess set available in 2019. 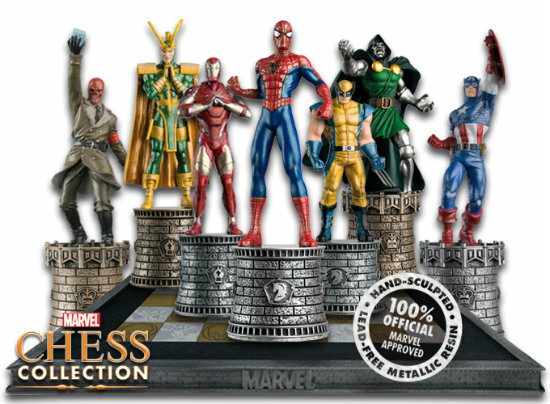 It is available for purchase as a full set or piece by piece, like with the Marvel chess set. The pre-assembled set features all of the most recognizable heroes and villains from DC comics, including Superman, Wonder Woman, Green Lantern, Batman, Supergirl, Aquaman, The Flash, Lex Luthor, The Joker, and many more! These pieces are every bit as detailed and high quality as the ones in the Marvel chess set, as they have been meticulously hand painted by artists as well. 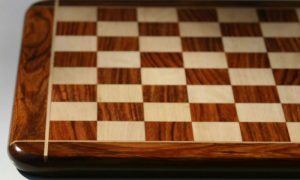 The chess board that comes as part of the Justice League chess set is also an impressive piece of craftsmanship. 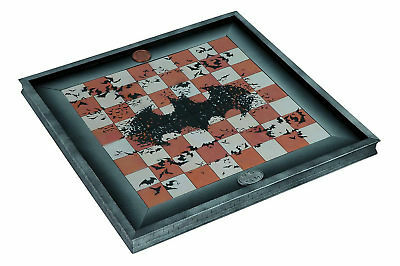 It is painted with a metallic finish that matches the silver and bronze sheen of the chessmen, and it also has the Bat symbol embossed in the middle of the board. The border is made of a detailed brick surround that evokes the memorable architecture of Gotham and ties in with the bases of each piece. Superheroes and their opposing forces have become quite a phenomenon in pop culture lately. 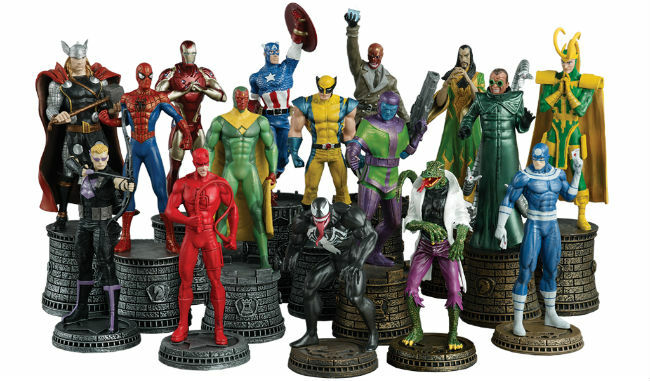 Their rise in popularity has led to the making of many different Marvel chess sets, Justice League chess sets, and even a few Marvel vs. DC chess sets. For more than 10 years now, summer blockbuster lists have been packed full of superhero movies – both Marvel and DC. Still, the end of this cultural phenomenon is nowhere in sight as more and more heroes are featured on the silver screen. Of course the big ones like Superman, Batman, Spiderman, the Incredible Hulk, Iron Man, and Thor were all featured early on. But now the general public is starting to be introduced to lesser known heroes that previously only comic readers knew about, like Ant Man, Deadpool, Black Panther, and others. As the cinematic superhero universe is expanding, more and more characters are being pulled in, and more and more lesser known storylines are being pulled onto the big screen. As a result, fans have more and more characters to choose from when building armies for their Marvel chess set. In 2019, names that you would only ever hear in discussion at a comic convention, like Thanos and Captain Marvel are household names being discussed over dinner tables all across America and beyond. The cultural impact of superheroes is already immense, but it just keeps growing and growing, becoming a huge part of the zeitgeist. You couldn’t walk down a toy store aisle anywhere in the country without seeing at least one superhero figurine or a Justice League chess set. 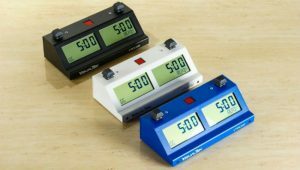 In prior years, these types of toys would need to be special ordered or bought at specific shops. My, how times have changed! Now, it would be difficult to find someone who had never seen a single superhero movie, and more and more people are seeing the films and then becoming interested in reading the comics. Only a few years ago, comic books were thought to be a dying medium, but now there is more interest in them than ever before! 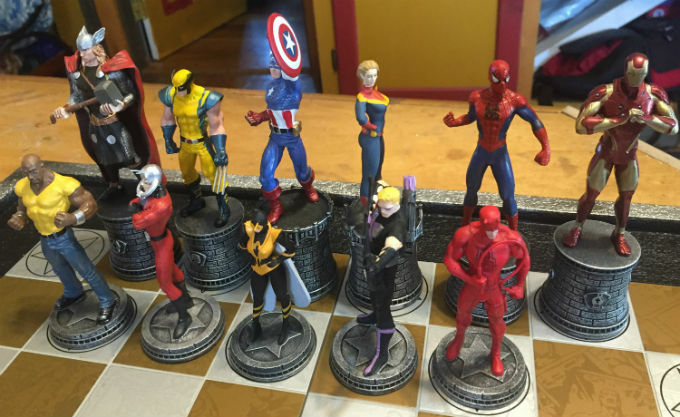 A product like a Marvel vs DC chess set would have needed a very specific buyer before, but now super hero chess sets are flying off the shelves! It’s amazing how quickly these things can change. 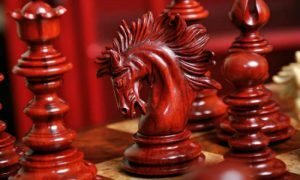 Chess Set: List of the Best Chess Sets of 2019.